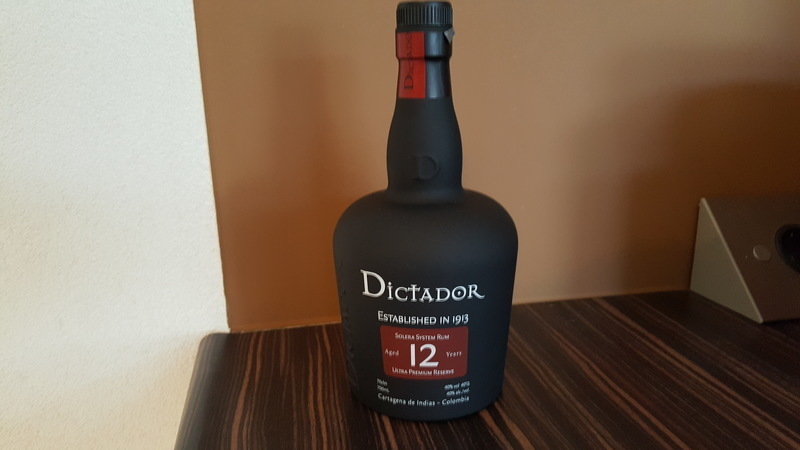 Have you found an online vendor selling Dictador 12-Year? Very thick, oily consistency, orange and brown sugar with great amount spice - just right. Long finish that lingers, but with the oil a little too long even with a splash of water. Do not be confused by the dark bottle, it hides an excellent rum. The aroma of chocolate, coffee, nuts... smooth nose. The taste then presents a soft bitter sweet tone, you feel both chocolate and coffee. In the throat you feel only smooth and pleasant warmness. The afterburn keeps on long and is really fine. I am looking forward to trying the Insolent one. Schöne Flasche. Riecht nach caramel. Im Geschmack etwas viel Holznote. First off, it is a wonderfully smooth rum with a good kick of alcohol in the tail, that gives a good length. It also helps prevent what is quite a sweet rum from being cloyingly sweet. And for me it is that sweetness that is its biggest fault. That's being a tad harsh, as in the scheme of things, there are far sweeter rums than this. It does detract a bit from the wonderful and multi-dimensional nose dominated by honey and coffee notes, which carries onto the palate. A really good rum, that is just a wee bit too sweet for me. Compared to 20y it was quite disappointing experience. Not complex enough, kinda lacking afterburn, too much coffee (even I'm ok with it). A bit stronger, not sweet. Nose: Coffee, quite strong alcoholic smell. Taste: Very strong, warms you up a lot. The end is with really intensive coffee taste. nice rum similar to abuelo 7. a little bit stronger afterburn. i would expect more from nr 12 written on the label. Not too sweet similar to Zacapa 23 but with less complex aroma and taste. Da zieht es einem die Nase ins Glas ! Im positiven Sinn ! im Gaumen kommt noch Kaffee und Baumnuss (Walnuss) dazu. Super für einen kalten Winterabend. Then it pulls your nose into the glass! In the positive sense! In the palate there is still coffee and walnut. Great for a cold winter evening. I can't say anything good about this rum. The small is boring and the taste was like a home brewed snaps. Sorry to say. Beautiful dark color. Nice and sweet but at least for me too much of a coffee taste which overshadows a bit the 'real' rum flavors. Still enjoyable! 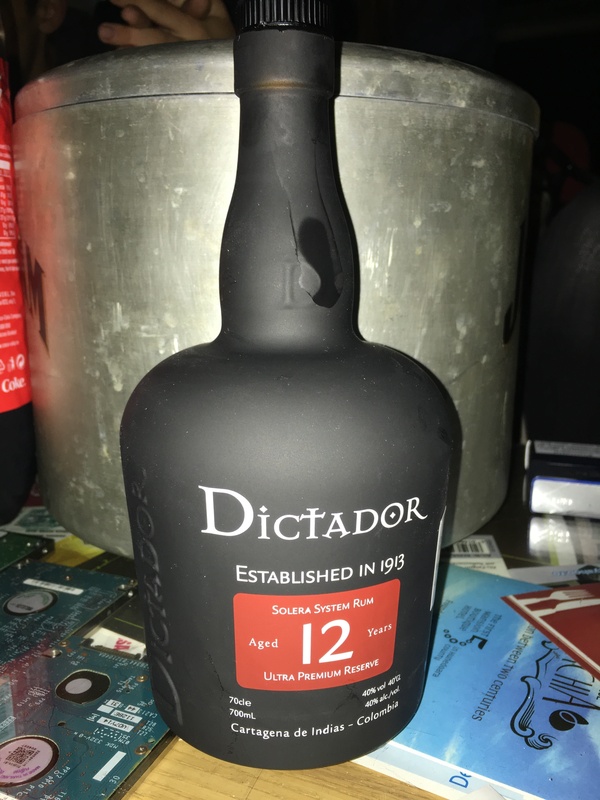 What's up with Dictador rums and their sweet coffee taste? This 12yo juice is very flavorful...if you like coffee liqueur. There is no way that their rums all have the coffee profile by accident. I'm guessing that the bottling machines need a thorough cleaning. Maybe the Dictador people add some sort of sweetener and coffee extract(?). This is tasty, but it's not pure rum by anyone's guess. Es un Ron dulce ideal para mezclarlo con refresco, tiene toques de vainilla. My favorite has been Plantation XO for a while, and this rum gets pretty close. Very smooth, slightly less body than the Plantation. A little bit more alcohol smell but not overpowering. I would purchase again. Mir gefällt dieser Rum sehr gut. Hat eine leicht merkliche Kaffeenote die zusammen mit der leichten Süße einen wunderbar runden Geschmack ergibt. Dieser Rum landet in meiner Bar! Un rhum assez doux. Bonne longueur en bouche. if you like whisky this one is for you...smells alcohol too..
An tasty rum coffe and cacao flavour cuban cigar. Best served on the rocks. Un rom foarte distins, cu o aroma deosebita. Se simt nuante foarte puternice de tabac si cafea, spre final se simt arome de citrice si miere. Merita incercat. Nose: Eh? Should this smell like the rubbery stuff the bottle is coated in – probably not, but it does. Weird. When the smell of latex catsuit (don’t ask) goes away there is some coffee in there, think roasted beans rather than brewed. Some smoky tobacco and prunes, quite earthy. Caramel and some vanilla too. Smells “manufactured”. Palate: Let’s hope this is better. Argh! That rubber again, where does that come from?! Well, mouth-feel is pretty good at least – quite oily. Ah, better now; dry actually, I was expecting a sweeter rum. Smoky again, earthy leaves and raisins. Not really much oak. Honey on burnt toast and then some of that coffee (brewed and black this time) as it moves to the finish. Finish: Short to medium and no rubber, phew. Ends sweeter than the palate and has some bitter oak as it tails off, smoky again. Toujours débutant en dégustation de rhum, je dois dire que c'est celui qui me reste en bouche le plus longtemps. Très bon gout épicé et doux qui se prolonge encore et encore. Très agréable et pas du tout agressif. A découvrir pour tout nouvel adepte dans ce monde du rhum !